The “loose moose” may finally have a permanent home. 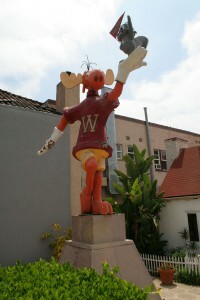 The West Hollywood City Council tonight will be asked to accept as a gift and permanently install a sculpture of “Rocket J. Squirrel and Bullwinkle J. Moose,” aka Rockie and Bullwinkle, on the edge of a city parking lot at 8775 Sunset Blvd. near Sherbourne Drive. The sculpture unexpectedly disappeared in July 2013. Alison Martino, whose Vintage Los Angeles Facebook page chronicles the history of the Sunset Strip, sounded the alarm there and in an article in Los Angeles magazine titled “Vintage Los Angeles: The Moose is Loose!” Eventually it was revealed that DreamWorks Studios and Twentieth Century Fox had funded a restoration of the sculpture as part of an exhibit at the Paley Center for Media in Beverly Hills. It reappeared on Oct. 9, 2014, inside the glass atrium of The Paley Center. The Council is being asked to appropriate $25,000 for the installation of the sculpture, $20,000 of which will come from a gift from the Gibson Guitar Foundation. Jay Ward’s family and the entertainment companies will donate the sculpture to the city. The city’s Arts and Cultural Affairs Commission also is recommending that the Council approve the permanent installation of “Doggie Dog: Homage to Giacometti,” a sculpture by Tsipi Mani that now sits in front of the West Hollywood Library. Mani has agreed to donate the sculpture to the city and it will remain in front of the library. The Council will consider the recommendations at its meeting tonight at 6:30 p.m. in the City Council Chambers at 625 N. San Vicente Blvd., south of Santa Monica. Boris and Natasha were evil Communists. The Russians fled Russia to escape those people. I don’t think they would object. The Russians that are here are American now. Rocky and Bullwinkle would always stand for the good of the people as a whole. Not a limited sector or specific group. They are clearly inclusive and good guys. They keep their word and you won’t find them at the Polo Lounge. Good points Luca. We should also consider that they could be in danger because of the fur ban. Even if they wouldn’t be for sale, they’d be on display. but, what are rocky & bullwinkle’s views on pay equity and marriage and gender equality ? how can we accept this ‘gift’ until we know if they will adhere to the ‘people’s agenda’ ? when everyone thinks the same, no one gets lost. I love this! Welcome back Rocky & Bullwinkle!